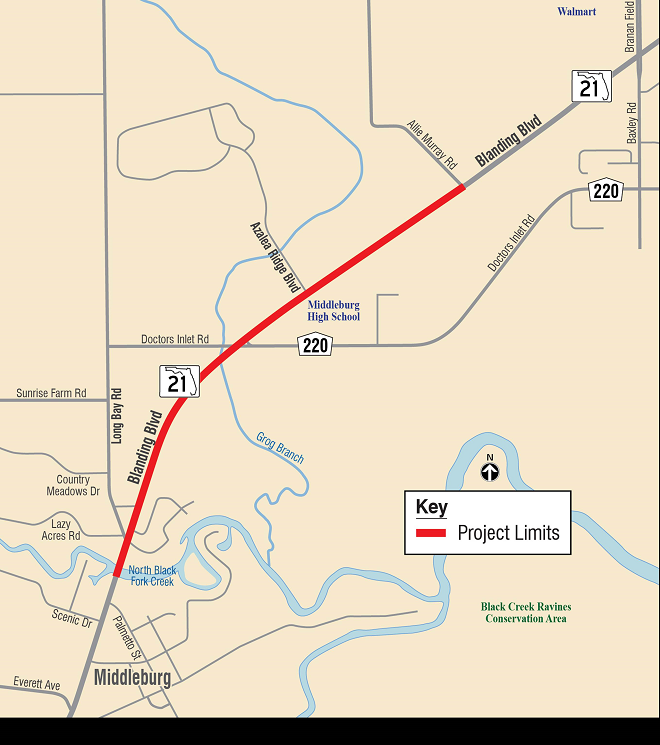 Construction on this segment of State Road 21/Blanding Boulevard in Clay County from Allie Murray Road to Long Bay Road (CR 220A) involves full reconstruction and widening to six lanes of the roadway in this area. Construction on this $18 million project also includes adding four-foot bike lanes and six-foot sidewalk in both directions, replacing traffic signals, adding street lights, and constructing a new drainage system including new pipes, inlets and small ponds. Medians are being narrowed to allow for the roadway widening and curb construction and some intersection realignment work will be done to better facilitate traffic signals and new travel lane alignment. The project contractor is R.B. Baker Construction Company. This project is a continuation of other recently-completed Blanding Widening projects that increased to six lanes the segment of Blanding Boulevard/State Road 21 from Old Jennings Road to Branan Field Road and from there south to Allie Murray Road. Motorists should anticipate similar, occasional lane closures necessary during construction once it begins. Standard overnight lane closure times may be adjusted as-needed based on work schedules, weather and traffic flow levels. A construction open house for this project was held December 10 at the Middleburg Civic Center to answer questions and discuss project details.